As part of ‘The Next Big Thing Blog Hop,’ I was tagged by Sheree L. Greer, talented author of the short story collection Once and Future Lovers, and whose work has appeared in Best Lesbian Romance 2012. The purpose of this hop is to expose folks to writers whose work perhaps they haven’t heard of, whether a new release (story, novel, novella, etc) or a Work in Progress (WIP). According to the rules of the hop, I will be answering some questions (the same ones for every other blog hopper) about either my newest release or my WIP and then at the bottom of the post, I’ll list a writer who will do the same thing in her blog next Wednesday, January 30. My father was the main source of inspiration for this book. In INHERITANCE, one moment, my father is normal, calm, quiet, in control, reliable; the next he is a wild-eyed stranger, screaming so loud that my ears sting. I sought to create a complex of feelings—of a sweet child’s adoration for her dad, of his need for validation, of my mother needing to keep things together for everyone’s sake, of Papa’s unhappy dreams, of a family caught in difficult circumstances and trying to survive them as well as they can, of children’s innocence as well as their deep knowing and caring, and of sisters being sisters. INHERITANCE is a memoir. Small pieces of it have been previously published on The Nervous Breakdown, a magazine featuring the work of published and emerging authors, poets, and other artists from around the world. Seriously? I get to choose? Denzel Washington or Will Smith would be perfect in the role of my father. Gabrielle Union could play Mother. INHERITANCE is the story of a Haitian childhood, of a narrator’s fevered need to escape both an irascible father and a place where violence and bloodshed are commonplace. INHERITANCE is a memoir that describes a sometimes difficult and sometimes pleasurable journey through the narrator’s childhood and teenage years in Port-au-Prince in the 1990’s. This work aims at capturing the tone of a very young person caught up in her own adolescent world—with all the innocence and evil, cruelties and fears—as she witnesses social chaos. The book uses turmoil on three levels: the narrator’s personal turmoil, the turmoil at home living with her father, and largely, the turmoil of the country as a whole, in its various iterations. Influenced thematically by Mary Karr’s CHERRY, which describes the author’s troubled relationship with her mother and her desire to leave the town where she was raised, INHERITANCE focuses on my relationship with an irascible father and my own fevered need to escape a place where violence and bloodshed are commonplace. As I attempt to leave, I discover an acute interest in medicine and writing, which both help me gain a better understanding of my father and become an independent woman with an attuned sense of herself. The control that I exercise on my emotions at the end of the book will allow for a normal, independent life away from home. I’m hoping to find an agent. Before I begin my search, however, I do want to do two last rounds of revisions. Six years! I started the memoir when I first enrolled into the Creative Writing program at Florida International University in 2006—and it’s still a work in progress! I want INHERITANCE to strike the reader as authentic. I’ve been deeply invested in the story, and I’ve worked religiously on the quality of the “characters,” the vividness of the world, and the depth of the themes I’ve addressed. I think I’ve reached the point where I communicate both an integrity and seriousness of purpose. I take the reader into Haiti, into the thick, oppressive heat, into the turmoil, into the terror and beauty and textures, the foods, drinks, and precautions. I follow the influence of both my father and Haiti’s social crisis as I try to tame the anger rising inside. Readers will discover facets of Haiti that they would probably never explore otherwise. Although I’m not trying to make any large cultural commentary in this memoir, I’ve been true to both myself and my experience. This story shows rawness and vulnerability, which I hope to be deeply compelling. If this blog indeed sparks your interest in my memoir, you can read excerpts from it on The Nervous Breakdown. Thanks for stopping through! 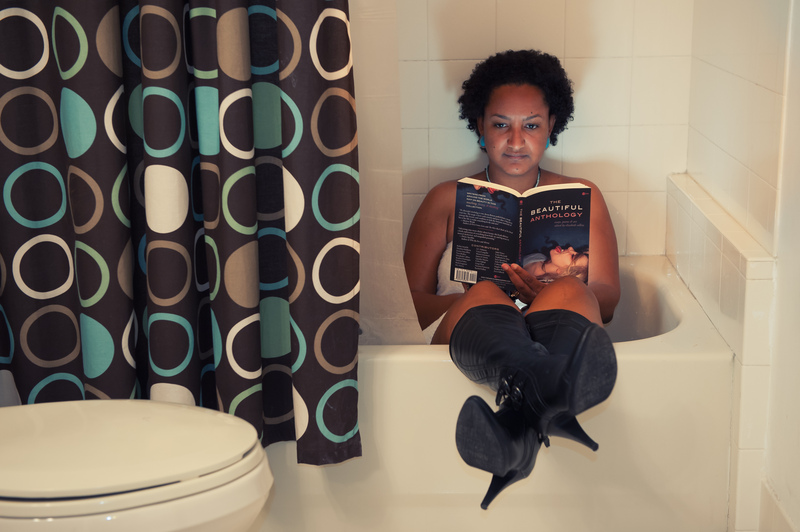 Next week you can read about The Next Big Thing for amazingly talented writer Katia D. Ulysse! Also, check out previous hops by Geoffrey Philp and Joe Clifford. Thanks for the support, Cecilia! Who knows? Maybe in a year or two!